* -> Some landing passengers do not actually disembark. Eg a passenger on a flight London > Freetown with a stopover in Monrovia to pick up and drop other passengers will land in Monrovia but not disembark. The number indicated takes into account that passenger. 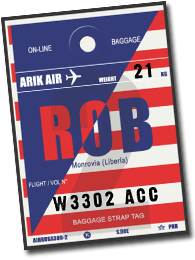 (5) Number of passenger commercial aircraft (regular + charter) that landed in Monrovia *. (6): Number of passenger commercial aircraft (regular + charter) that took off from Monrovia *. * -> The difference between the number of aircraft on takeoff and on landing is explained by night flows (eg aircraft landing at 23:00 and taking off for return at 00:50) and by traffic rights for certain segments only.